The Workplace Hazardous Materials Information System (WHMIS) provides health and safety information about hazardous products in the workplace. 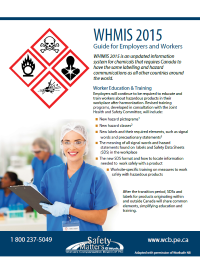 WHMIS 2015 is an updated information system for chemical products stored, handled or used in Canadian workplaces. The transition phases, associated with the updates to this system, are coming to an end. As of December 1, 2018, all workplaces are expected to be in compliance with the new WHMIS requirements. Use up WHMIS 1988 products. Re-label WHMIS 1988 products with a WHMIS 2015 compliant workplace label, and obtain or prepare a WHMIS 2015 compliant Safety Data Sheets (SDS). 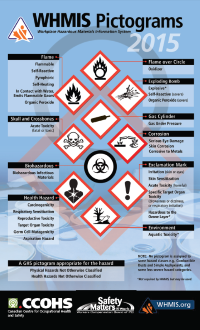 A hazardous product is produced (made) and used in your workplace. 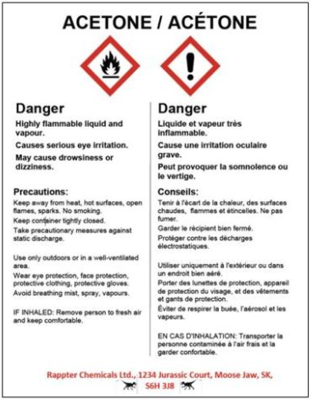 A hazardous product is imported directly to the workplace and either has no supplier label or has one that does not meet requirements of the Hazardous Products Regulations and the product is only being used at the workplace. A supplier label becomes lost or unreadable. A hazardous product is decanted (transferred or poured) into another container. all of the decanted product will be used during the same shift. For example, if you pour a hazardous product into a container (such as a jar, spray bottle, or bucket), you write the product’s name on the container, you’ll be the only person who will use the decanted product, and you’ll use all of it during the same shift, then you don’t need to apply a label. When you’ll use the decanted product immediately and completely. In this situation, you don’t need to apply a workplace label or write the product’s name on the container. Click here for more information on how to create a workplace label. Re-label WHMIS 1988 products with a WHMIS 2015 compliant supplier label, and obtain or prepare a WHMIS 2015 compliant Safety Data Sheet. 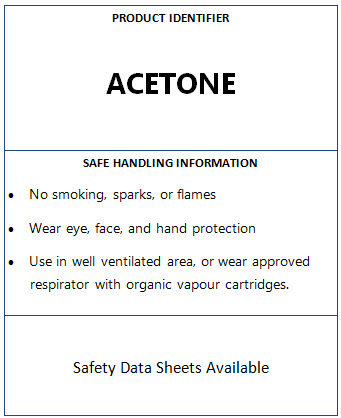 A supplier label is provided for each hazardous product by the supplier. Supplier labels must be clearly and prominently displayed on the container. Click here for additional information on supplier labels. Education and training can be thought of as two separate parts. 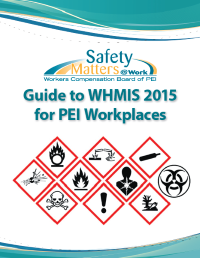 Education is often covered through a general WHMIS course where a certificate is issued. Training refers to the site and job specific information to employees that will cover your workplace’s procedures for storage, handling, use, disposal, emergencies, spills and what to do in unusual situations. If the worker is unable to answer the questions above, it may be an indication that the worker does not fully comprehend the education and training provided and may be required to attend the training again.